Our Adjustable Narrowband Isolators can be tuned to maximize the peak isolation for any wavelength within a narrow spectral range (shaded in this graph based on theoretical data). Please see the Wavelength Tuning tab for more details. 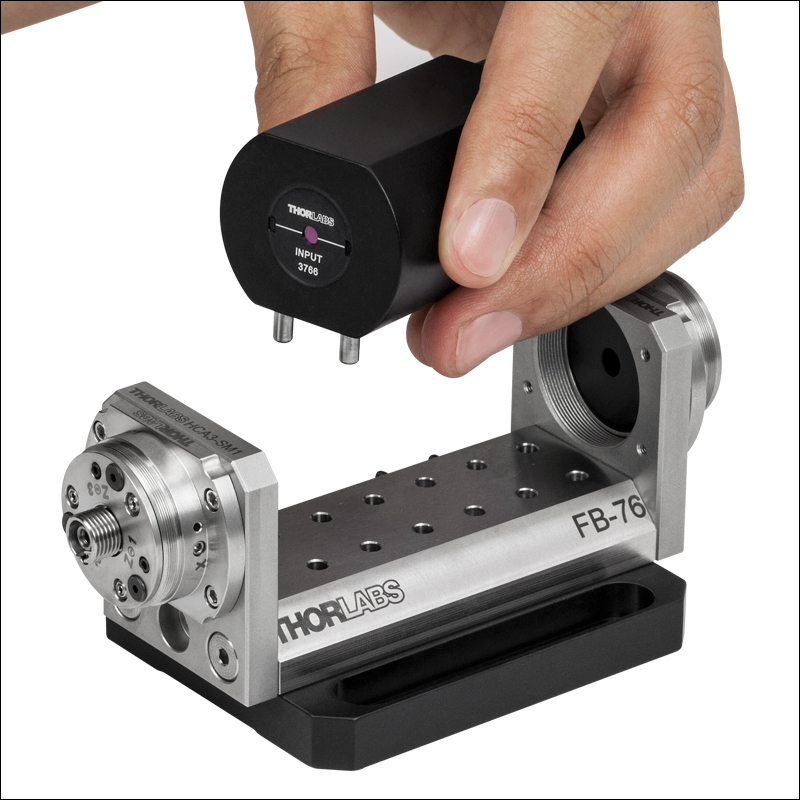 Thorlabs' Free-Space Adjustable Narrowband MIR Optical Isolators are designed for use in the MIR spectral range (2.20 - 9.80 µm). Optical isolators, also known as Faraday isolators, are magneto-optic devices that preferentially transmit light along a single direction, shielding upstream optics from back reflections. Back reflections can create a number of instabilities in light sources, including intensity noise, frequency shifts, mode hopping, and loss of mode lock. In addition, intense back-reflected light can permanently damage optics. Please see the Isolator Tutorial tab for an explanation of the operating principles of a Faraday isolator. BA1 1 Mounting Base, 1" x 3" x 3/8"
Isolators can be mounted close to the breadboard surface. These isolators are factory aligned to provide peak isolation at the specified center wavelength. They also offer the user the ability to adjust the alignment of the output polarizer with respect to the input polarizer, allowing the peak of the isolation curve to lie anywhere within a 50 - 200 nm range; see the tables below for details. 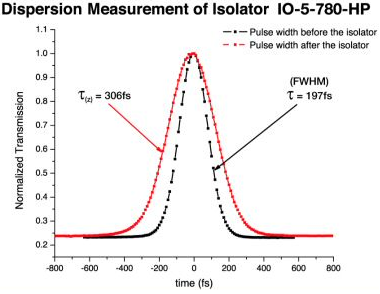 Please see the Isolator Types tab for additional design details and representative graphs of the wavelength-dependent isolation. Each isolator's housing is marked with an arrow that indicates the direction of forward propagation. 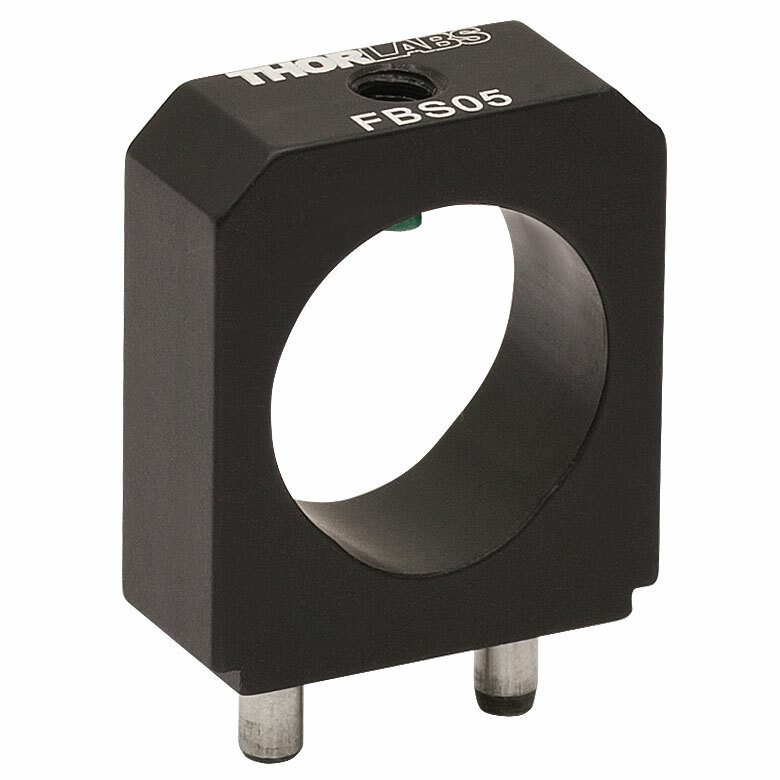 In addition, all isolators have engravings that indicate the alignment of the input and output polarizers. The isolators can be mounted in a variety of adapters; compatible mounting options are listed with each product as well as at the bottom of the page. Thorlabs also manufactures isolators for fiber optic systems and wavelengths extending down to the UV (see the Selection Guide table to the left). If Thorlabs does not stock an isolator suited for your application, please refer to the Custom Isolators tab for information on our built-to-order options, or contact Tech Support. 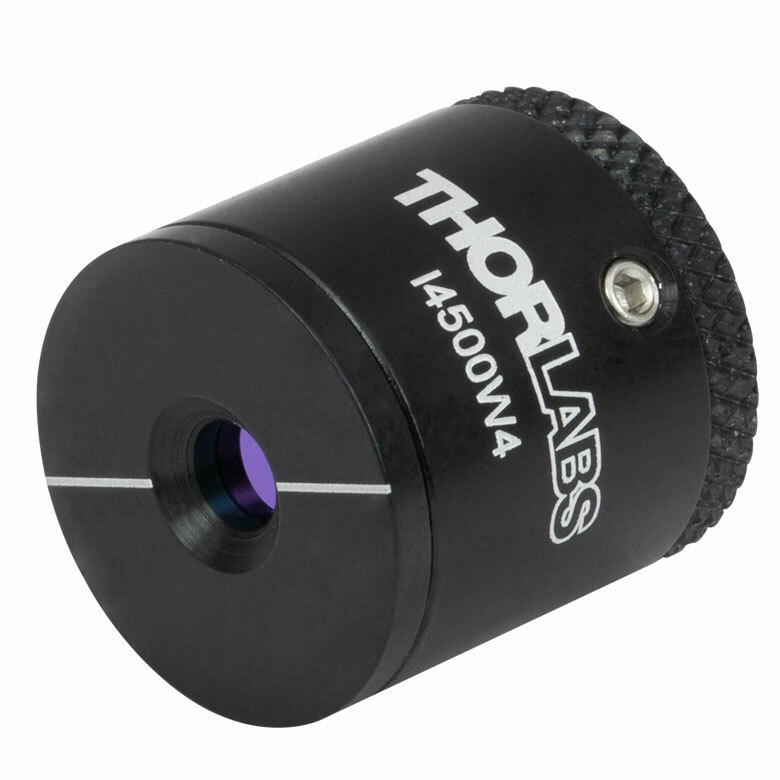 Thorlabs' in-house manufacturing service has over 25 years of experience and can deliver a free-space isolator tuned to your center wavelength from 244 nm to 9.80 µm. Our vertically integrated manufacturing structure allows us to offer Faraday rotators used in optical isolators. We offer a selection of these products from stock and can provide custom Faraday rotators upon request. The shaded region on each graph below represents the wavelength tuning range of the isolator. The peaks of the isolation and transmission curves can be shifted anywhere within this range by rotating the output polarizer, as detailed in the Wavelength Tuning tab. These curves show theoretical data; isolation and transmission will vary from unit to unit. 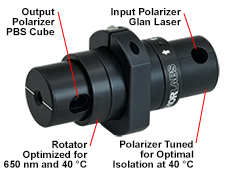 Optimize our isolators to provide the same peak isolation anywhere within their tuning range. The simple tuning procedure, illustrated below, consists primarily of rotating the output polarizer. Slight transmission losses occur due to the rotation of the polarizer. When the isolator is tuned away from its design wavelength, the maximum transmission falls because the output polarizer's transmission axis is not parallel to the polarization direction of the output light. 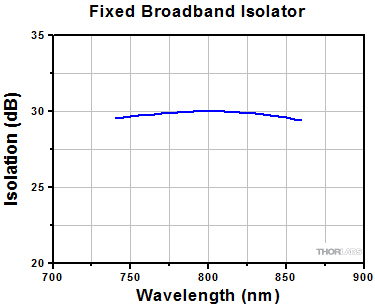 Our Adjustable Narrowband Isolators can be tuned to maximize the peak isolation for any wavelength within a narrow spectral range (shaded in this graph). 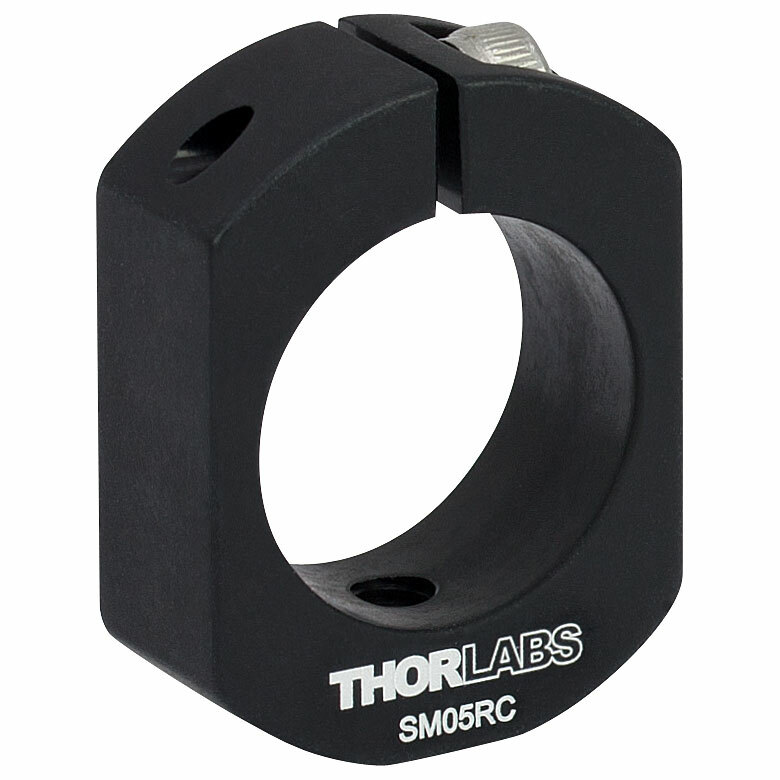 Thorlabs' Adjustable Narrowband Isolators are designed to provide the same peak isolation anywhere within a 50 - 100 nm tuning range. They contain a Faraday rotator that has been factory tuned to rotate light of the design wavelength by 45°. Light propagating through the isolator in the backward direction is polarized at 45° by the output polarizer and is rotated by 45° by the Faraday rotator, giving a net polarization of 90° relative to the transmission axis of the input polarizer. Therefore, an isolator rejects backward propagating light. See the Isolator Tutorial tab for a schematic of the beam path. The magnitude of the rotation caused by the Faraday rotator is wavelength dependent. This means that light with a different wavelength than the design wavelength will not be rotated at exactly 45°. For example, if 4.5 µm light is rotated by 45° (that is, 4.5 µm is the design wavelength), then 4.45 µm light is rotated by 45.4°. 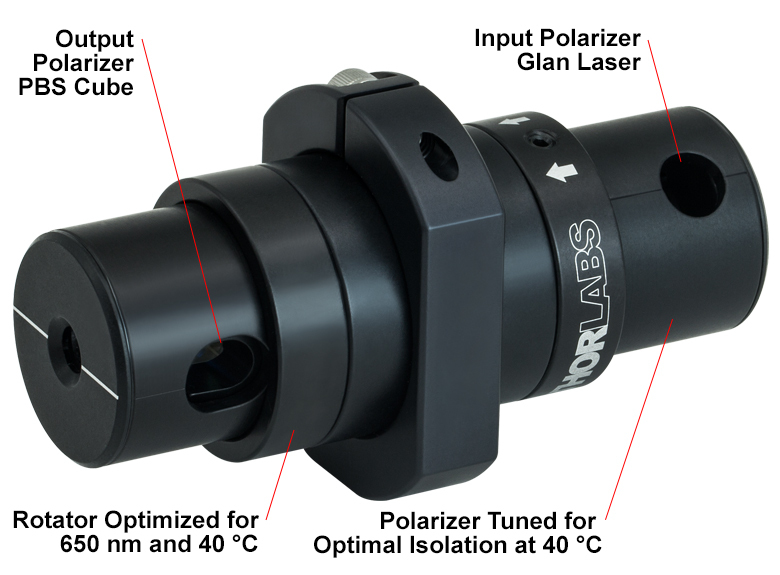 If 4.45 µm light is sent backward through an isolator designed for 4.5 µm without any tweaking, it will have a net polarization of 45° + 45.4° = 90.4° relative to the axis of the input polarizer. The polarization component of the light parallel to the input polarizer's axis will be transmitted, and the isolation will therefore be reduced. Since the net polarization needs to be 90° to obtain the maximum isolation, the output polarizer is rotated to compensate for the extra rotation being caused by the Faraday isolator. In our example, the new polarizer angle is 90° - 45.4° = 44.6°. This adjustment increases the isolation back to the same value as at the design wavelength. Here, θ is the angle between the polarization direction of the light after the Faraday rotator and the transmission axis of the polarizer, I0 is the incident intensity, and I is the transmitted intensity. The decrease in transmission is very slight for our mid-IR isolators. In our example (a 50 nm difference between the design wavelength and the usage wavelength), θ = 45.4° - 44.6° = 0.8°, so I = 0.9998 I0. This case is shown in the graphs above. 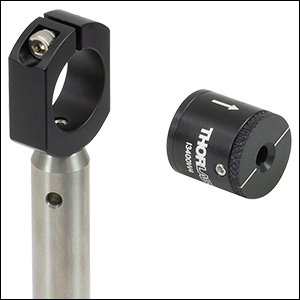 Thorlabs' isolator housings make it easy to rotate the output polarizer without disturbing the rest of the isolator. Our custom isolator manufacturing service (see the Custom Isolators tab) can also provide an isolator specifically designed for a particular center wavelength. These custom isolators are provided at the same cost as their equivalent stock counterparts. For more information, please contact Technical Support. To optimize the isolation curve for a specific wavelength within the tuning range, the alignment of the output polarizer may be tweaked following the simple procedure outlined below. Only a minor adjustment is necessary to cover a range of tens of nanometers. An isolator need only be fine-tuned once it has undergone its mandatory initial alignment. The fine-tuning process differs slightly for different isolator packages, but the principle remains the same across our entire isolator family, and complete model-specific tuning instructions ship with each isolator. Orient the isolator so that the arrows on the housing are pointing towards the laser. Place the isolator in a compatible mounting adapter, such as an SM05RC slip ring (mounting adapters shown below). A power meter with high sensitivity at low power levels should be placed after the isolator. 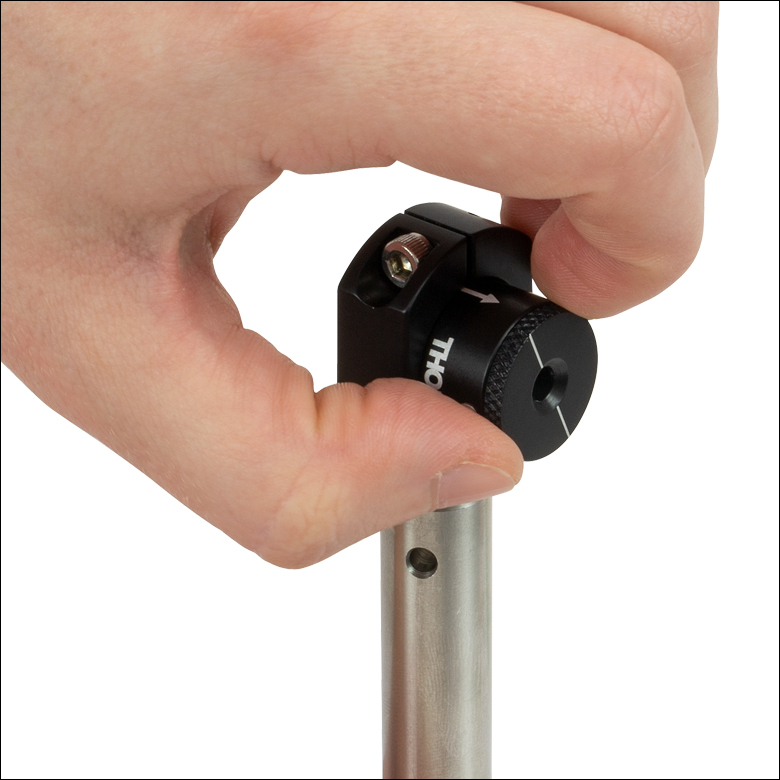 Secure the isolator in the mounting adapter by tightening the locking screw hex on the adapter. Note that the isolator should be secured in a way that exposes the polarizer tuning setscrew. The isolator is mechanically stable in this position as long as the isolator has not been brought forward too much. It should therefore not be necessary to reinsert the isolator at the end of the tuning procedure. 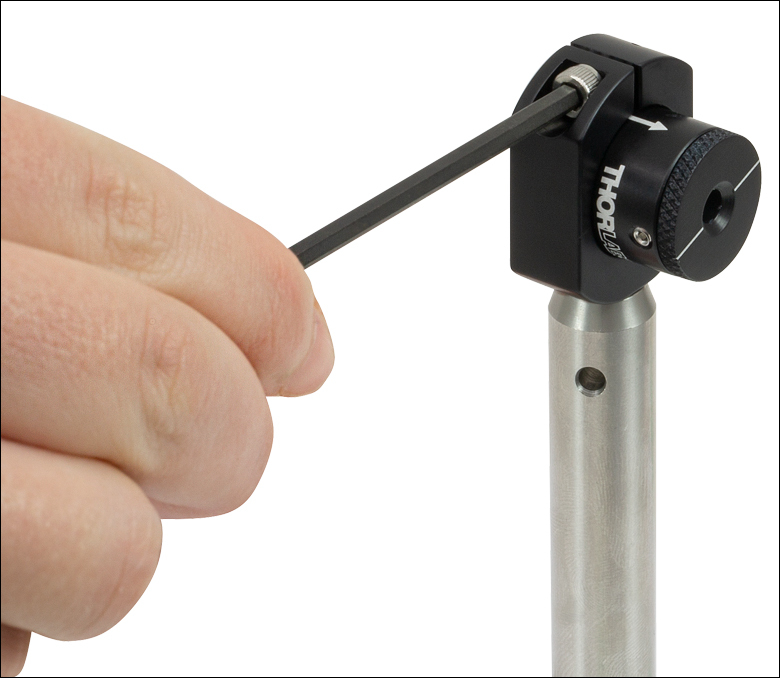 Loosen the exposed tuning setscrew using the provided 0.050" hex key. At this point, the output polarizer will be free to rotate. Rotate the output polarizer to minimize the power on the power meter. As explained above, the necessary adjustment should be less than 1°. Tighten the tuning setscrew once optimization is achieved. As long as the isolator was not brought forward too much at the end of Step 3, the isolator will be mechanically stable in this position. Attempting to reinsert the isolator at this point may cause misalignment. The isolator is set for 45° of rotation at the design wavelength. 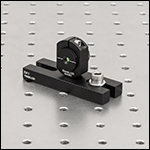 The polarizers are non-adjustable and are set to provide maximum isolation at the design wavelength. As the wavelength changes the isolation will drop; the graph shows a representative profile. The isolator is set for 45° of rotation at the design wavelength. If the usage wavelength changes, the Faraday rotation will change, thereby decreasing the isolation. To regain maximum isolation, the output polarizer can be rotated to "re-center" the isolation curve. This rotation causes transmission losses in the forward direction that increase as the difference between the usage wavelength and the design wavelength grows. The isolator is set for 45° of rotation at the design wavelength. There is a tuning ring on the isolator that adjusts the amount of Faraday rotator material that is inserted into the internal magnet. As your usage wavelength changes, the Faraday rotation will change, thereby decreasing the isolation. 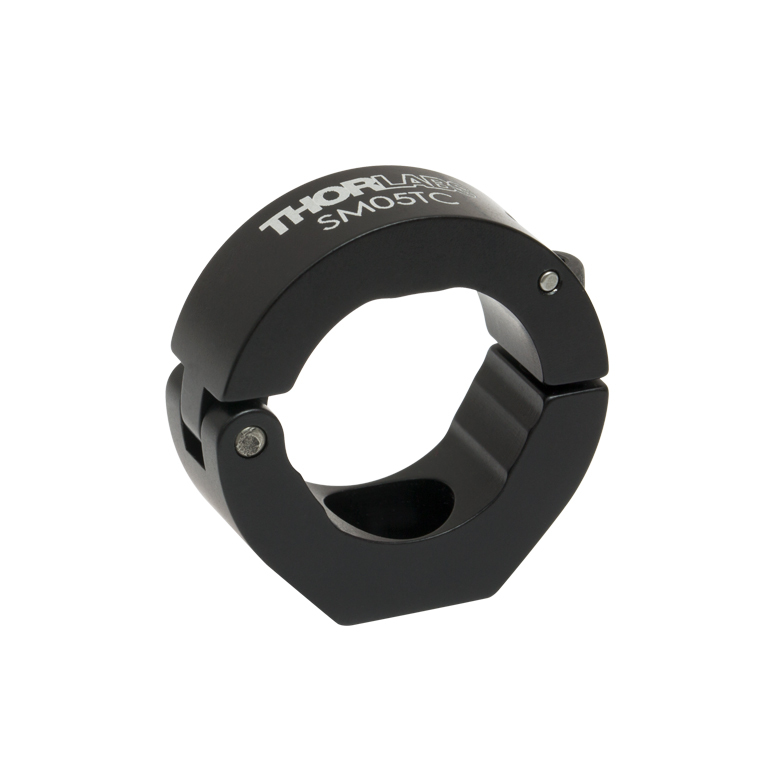 To regain maximum isolation, the tuning ring is adjusted to produce the 45° of rotation necessary for maximum isolation. A 45° Faraday rotator is coupled with a 45° crystal quartz rotator to produce a combined 90° rotation on the output. The wavelength dependences of the two rotator materials work together to produce a flat-top isolation profile. The isolator does not require any tuning or adjustment for operation within the designated design bandwidth. Tandem isolators consist of two Faraday rotators in series, which share one central polarizer. Since the two rotators cancel each other, the net rotation at the output is 0°. Our tandem designs yield narrowband isolators that may be fixed or adjustable. Thorlabs designs and manufactures several types of polarizers that are used across our family of optical isolators. Their design characteristics are detailed below. The part number of given isolator has an identifier for the type of polarizer that isolator contains. For more details on how the part number describes each isolator, see the given isolator's manual. 25 W/cm2 (CW, Transmission) Our Very Low Power Absorptive Film Polarizers are compact options for isolating free-space beams. For light polarized perpendicular to the polarizer's transmission axis, the max power density is 10 W/cm2, while for light polarized parallel to the polarizer's transmission axis, the max power density is 25 W/cm2. 100 W/cm2 (CW, Transmission) These polarizers are also for use with very low power sources but are made with a different material than the type C polarizers listed above. This gives these polarizers a higher maximum power density. For light polarized perpendicular to the polarizer's transmission axis, the max power density is 25 W/cm2, while for light polarized parallel to the polarizer's transmission axis, the max power density is 100 W/cm2. (W) 25 W/cm2 (CW) Wire Grid Polarizers are used in our mid-IR isolators. They consist of a linearly spaced wire grid pattern that is deposited onto an AR-coated silicon substrate. 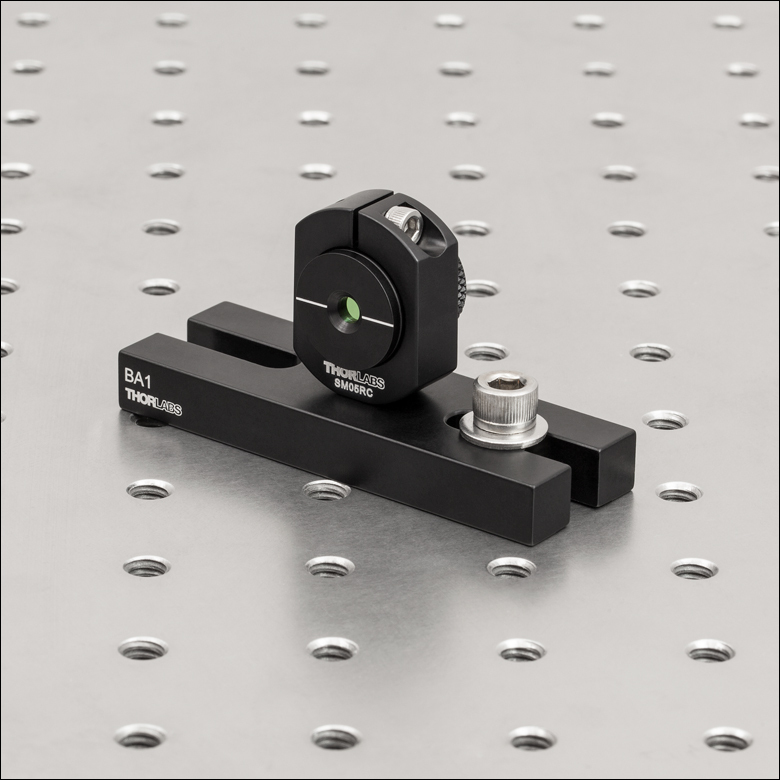 (PBS) 13 - 50 W/cm2 (CW) Polarizing Beamsplitter Cubes are commonly used in low-power applications and feature an escape window useful for monitoring or injection locking. (GLB) 100 W/cm2 (CW) Thorlabs' α-BBO Glan-Laser polarizers are all based on high-grade, birefringent, α-BBO crystals with a wavelength range of 210 - 450 nm. Due to the birefringent structure of α-BBO, a phase delay is created between two orthogonally polarized waves traveling in the crystal. These are similar to the High Power (HP) polarizers, but have a different escape angle. 25 MW/cm2 (Pulsed) Our Low Power Polarizers are Glan-type, crystal polarizers, providing high transmission and power densities at the expense of a larger package than Very Low Power (VLP) and Polarizing Beamsplitter (PBS) polarizers. 50 MW/cm2 (Pulsed) Medium Power Polarizers are Glan-type, crystal polarizers, capable of handling higher powers. The rejected beam is internally scattered, which reduces the maximum power density, but also eliminates a stray beam from the setup. 150 MW/cm2 (Pulsed) High Power Polarizers are Glan-type, crystal polarizers, similar in size and transmission to Medium Power (MP) polarizers, but capable of handling higher powers. They feature an escape window suited for injection locking. (YV) 25 W/cm2 (CW) YV polarizers are similar to the Medium Power (MP) Glan-type crystal polarizers; however, by using yttrium orthovanadate (YVO4) rather than calcite, YV polarizers can accommodate wavelengths in the 2.0 - 3.4 µm range. The rejected beam is internally scattered, which reduces the maximum power density, but also eliminates a stray beam from the setup. 2 GW/cm2 (Pulsed) Our Very High Power Polarizers are based on Brewster windows and feature the highest power handling possible. 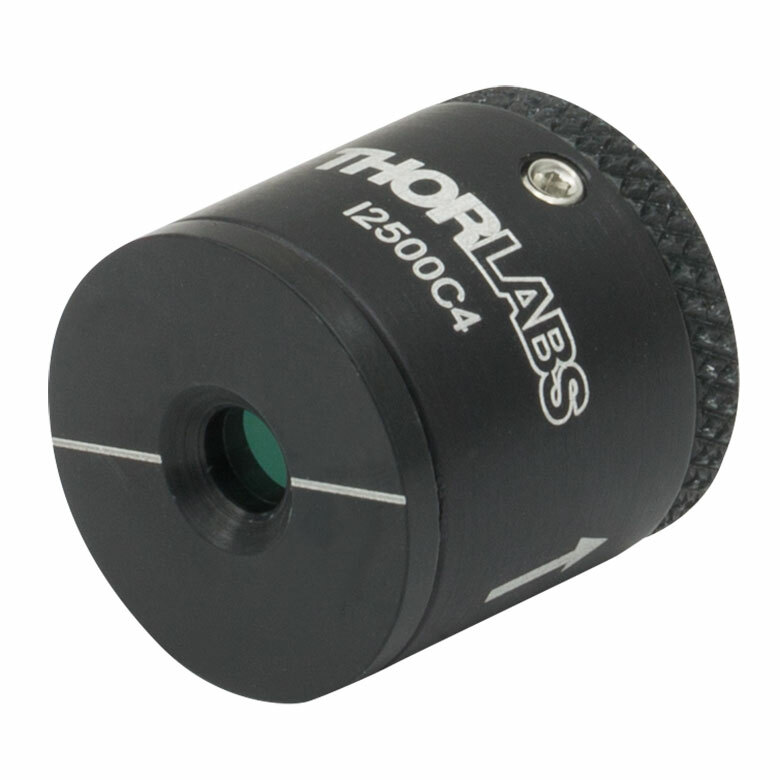 These polarizers have larger packages than HP-based designs, but are also more economical. All VHP-based designs also feature escape windows. Custom Adjustable Narrowband Isolator with Different Input and Output Polarizers Optimized for 650 nm Wavelength and 40 °C Temperature. 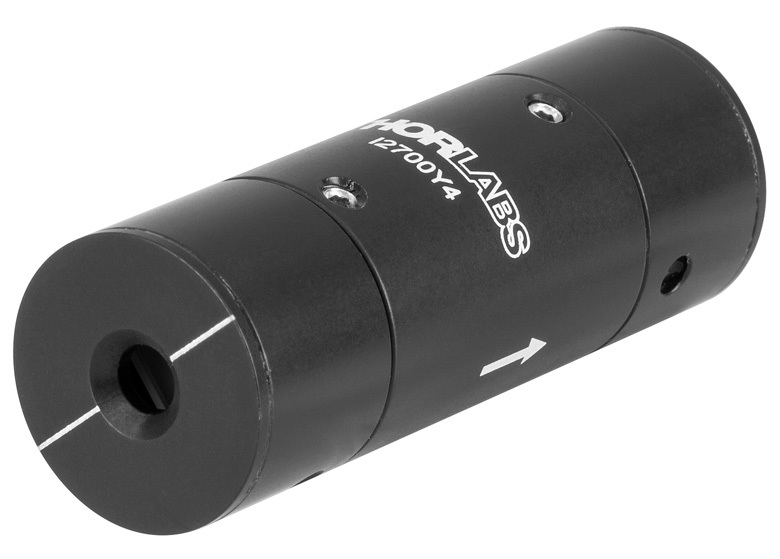 In an effort to provide the best possible service to our customers, Thorlabs has made a commitment to ship our most popular free-space and fiber isolator models from stock. We currently offer same-day shipping on more than 90 isolator models. 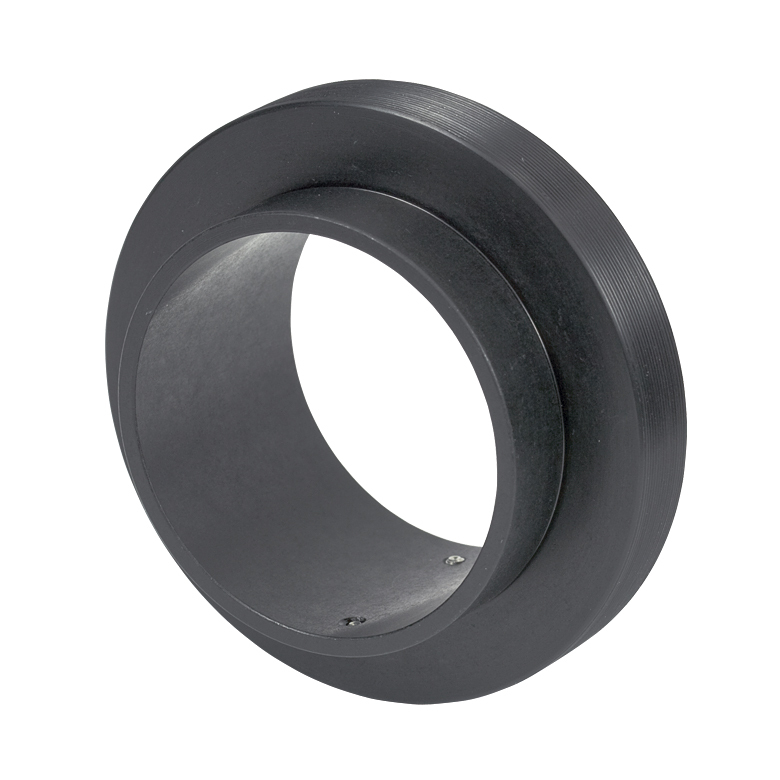 In addition to these stock models, non-stock isolators with differing aperture sizes, wavelength ranges, package sizes, and polarizers are available. In addition, we can create isolators tuned for specific operating temperatures and isolators that incorporate thermistors with heating or cooling elements for active temperature control and monitoring. These generally have the same price as a similar stock unit. If you would like a quote on a non-stock isolator, please fill out the form below and a member of our staff will be in contact with you. Thorlabs has many years of experience working with OEM, government, and research customers, allowing us to tailor your isolator to specific design requirements. In addition to customizing our isolators (see the OEM Application Services list to the right), we also offer various application services. 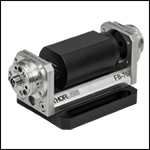 Custom Faraday rotators, for use in the 244 to 5000 nm range, are also available. The maximum power specification represents the maximum power for the combined forward and reverse directions. Therefore, the sum of the powers in the forward and reverse directions cannot exceed the maximum power specification. We are able to provide a wide range of flexibility in manufacturing non-stock, free-space isolators. Almost any selection of specifications from our standard product line can be combined to suit a particular need. The table to the right shows the range of specifications that we can meet. We offer isolators suitable for both narrowband and broadband applications. The size of the housing is very dependent on the desired maximum power and aperture size, so please include a note in the quote form below if you have special requirements. We can also offer Faraday rotators which rotate the polarization of incoming light by 45° ± 3°. These are similar to our isolators but with the polarizers at each end removed. 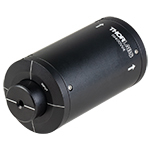 They are available with center wavelengths from 244 to 5000 nm. For wavelengths shorter than 633 nm, we recommend using our free-space isolators in conjunction with our modular FiberBench accessories. Please contact Technical Support for more information. 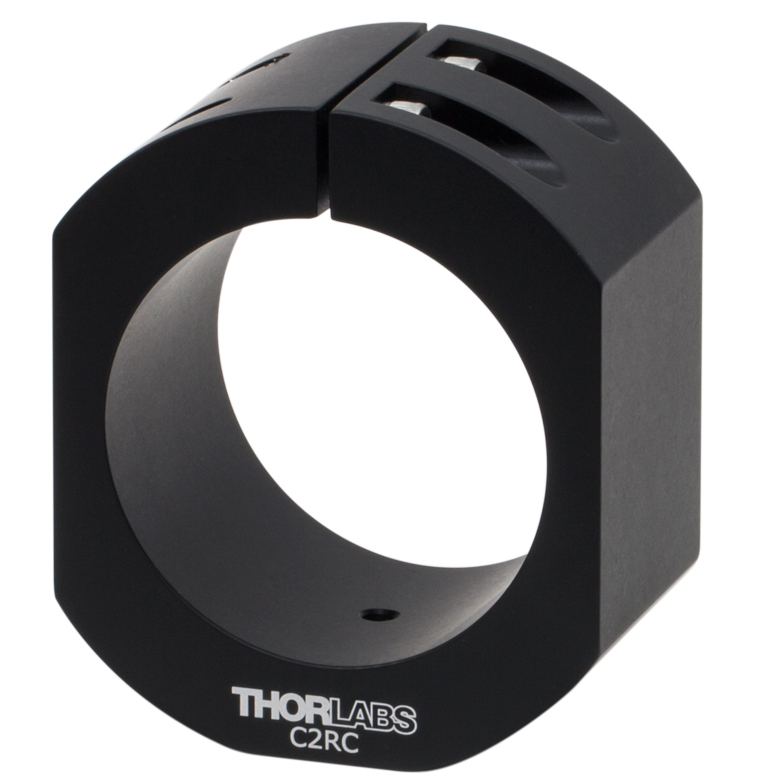 Thorlabs is uniquely positioned to draw on experience in classical optics, fiber coupling, and isolators to provide flexible designs for a wide range of fiber optic specifications. Current design efforts are focused on increasing the Maximum power of our fiber isolators at and near the 1064 nm wavelength. We offer models with integrated ASE filters and taps. The table to the right highlights the range of specifications that we can meet. The fiber used is often the limiting factor in determining the Maximum power the isolator can handle. We have experience working with single mode (SM) and polarization-maintaining fibers (PM); single-, double- and triple-clad fibers; and specialty fibers like 10-to-30 µm LMA fibers and PM LMA fibers. For more information about the fiber options available with our custom isolators, please see the expandable tables below. 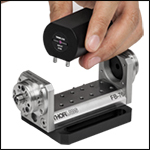 In the spectral region below 633 nm, we recommend mounting one of our free-space isolators in a FiberBench system. A FiberBench system consists of pre-designed modules that make it easy to use free-space optical elements with a fiber optic system while maintaining excellent coupling efficiency. 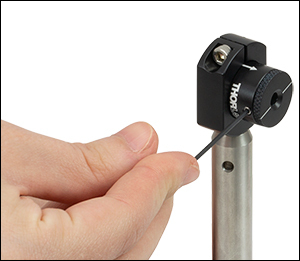 Upon request, we can provide select stock isolators in an optic mount with twin steel dowel pins for our FiberBench systems, as shown to the left. We are also in the process of extending our fiber isolator capabilities down into the visible region. For more information, please contact Technical Support. The expandable tables below provide information on some common isolator and rotator specials we have manufactured in the past. We keep the majority of the components for these custom isolators in stock to ensure quick builds, so these specials are available with an average lead time of only 2-4 weeks. Please use the Non-Stock Isolator Worksheet below for a quote. Request a custom isolator quote using the form below or by contacting us for more information at (973) 300-3000. Is this an ITAR request? : Yes | No Not sure? ITAR (International Traffic in Arms Regulation) is a United States Government regulation controlling the import and export of defense-related articles on the United States Munitions List (USML). Information and material pertaining to military and defense related technology may only be shared with U.S. Persons unless authorization from the Department of State is received or a special exemption is used. Hello, thank you for contacting Thorlabs. I have contacted you directly about these inquiries. The following selection guide contains all of Thorlabs' Free-Space Optical Isolators. Click the colored bars below to to see specifications and options for each wavelength range and isolator type. Please note that Thorlabs also offers fiber optical isolators and custom optical isolators. Specified at center wavelength. See Performance Graph for wavelength dependence. Defined as containing 100% of the beam energy. The maximum power specification represents the maximum power for the combined forward and reverse directions for a Gaussian beam. Therefore, the sum of the powers in the forward and reverse directions cannot exceed the maximum power specification. The blocking power density corresponds to light polarized perpendicular to the transmission axis, while the transmission power density corresponds to light polarized parallel to the transmission axis. Please see below for more information on compatible mouting adapters. These adapters provide mechanical compatibility between our isolator bodies and Ø1/2" posts, Ø1" posts, or FiberBench systems. Isolator Diameter 0.70" 0.70" 0.70" 2.0" 2.0"